A comfortable and cosy studio rental house (casita) on the road from the public dock up to Santa Cruz village, situated on Lake Atitlan’s north shore. 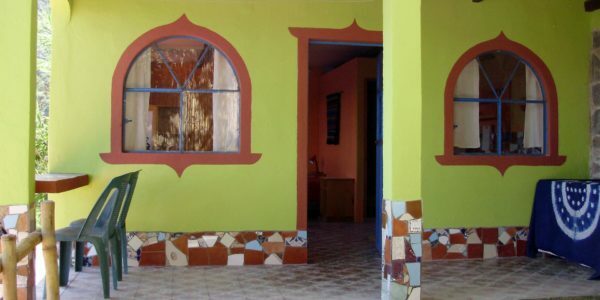 It is a perfect rental for volunteers working in the village with the various NGOs based there. It is a bit of a steep climb up, but the views are well worth the effort! Alternatively, tuk tuks from the public dock can drop you off just metres from the house. A double bed and living area occupy the largest part of the house, while a slightly separated kitchen and eating area are at the front of the house and along with the large terrace at the entrance have views to die for of Lake Atitlan and its resident volcanoes. Situated in the extremely popular Kakchiquel, Mayan village of Santa Cruz, it makes a perfect position for relaxing and enjoying the lake, and also for exploring all the other villages around the lake. Although only accessible by boat (lancha), Santa Cruz is only a 10-15 min boat-ride from Pana(jachel), the commercial and transport hub for Lake Atitlan. Boats ply across this north shore from Pana to San Pedro approx. every 20 mins from 6am – 5pm, so it is very easy to travel around. Santa Cruz has a variety of hotels with good restaurants, but all shopping and banking will need to be done in Pana. However, a lovely local lady can deliver delicious food, hot to your table, with just 24-hours notice! There is the CECAP restaurant in Santa Cruz and don’t forget the great Farmers’ Market every Saturday morning at the La Iguana Perdida Hotel, by the public dock. And don’t forget the Sat evening BBQ and live music at La Iguana Perdida.